Cross is awesome! I did my fourth race this weekend and had a blast. This was the fourth race of the Seattle Cyclocross Series at Sprinker Recreation Center in Tacoma, WA. Thanks to my dad I was able to record this race with my new Contour camera (video above). This course was a lot of fun. Mostly flat and fast with a few short hills and run-ups. I had my best start of the season and was within the top 15 for the first lap and a half. As you can see at the end of the video, I failed miserably at dismounting on the double barricade on the second lap smacking right into it. Subsequently, my chain was dropped and so was I. I ended up finishing 23rd. Either way, I had a lot of fun doing it. Looking forward to the next race of the series. 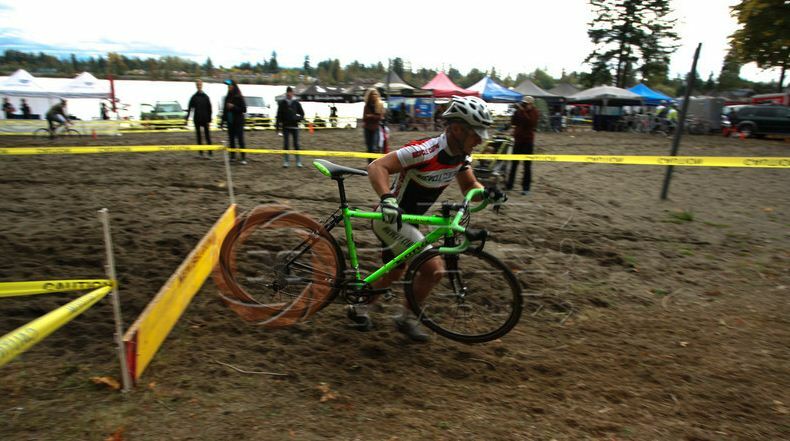 This weekend I raced in the Seattle Cyclocross Series (SCX) race #3 at Silver Lake. This was only my second CX race ever and presented many challenges. The Silver Lake course is arguably one of the most difficult courses of the SCX series and now I know why. SAND! Lots of it! Not to mention hills and barricades followed by steep grades. Right out of the gate you hit the beach along Silver Lake for about 15o yards of sand. It started off alright, but at my weight, I would start digging deeper and deeper into the sand and slowing. Then, it’s an all out grind to get out of it without dismounting. Almost immediately after getting out of the sand comes a turn into a single barricade followed by a hill. I tried an uphill mount on the less steep portion but failed when I couldn’t clip in. Finally, we get a break on a winding flat trail and short downhill. Coming back near the start, we hit the sand again. This time it was about 50 yards of packed sand and then a pit requiring dismount. Next was a section with some short but tough climbs, technical descents, and tight corners as well as a double barricade in sand followed immediately by running up a hill. Getting back toward the lake there was a tight technical cornering section into the finish. I started behind all of the call-ups in an all out sprint into the first sand pit. I was waiting for someone to go down in front of me or swerve into me due to the sand, but somehow we made it through. If I’ve noticed anything in these races, the first lap is always brutal. Everyone is going balls to the wall to try to get the best position possible before the pace mellows. The climb up after the first barricade was miserable but the adrenaline keeps you going. After the second sand section, barricade and run-up, I was definitely feeling the lactic acid build-up. My quads felt like they were about to explode. From here I decided to try to recover a little and take a more relaxed pace for the next two laps. Staying in control and being cautious, I passed several others who went down in front of me or made mistakes in corners. On the last lap, it was time to pick the pace back up and try to stay in position. In the final lap, turn section I traded places several times with the rider in front of me. I’d pass on one turn, he’d pass on the next… Finally, I passed him before sprinting to the finish. This race was a blast! Definitely one to give you the CX bug. Lot’s of technical challenges to keep you on your toes. I would recommend this as one of the most challenging and fun courses of the SCX series.